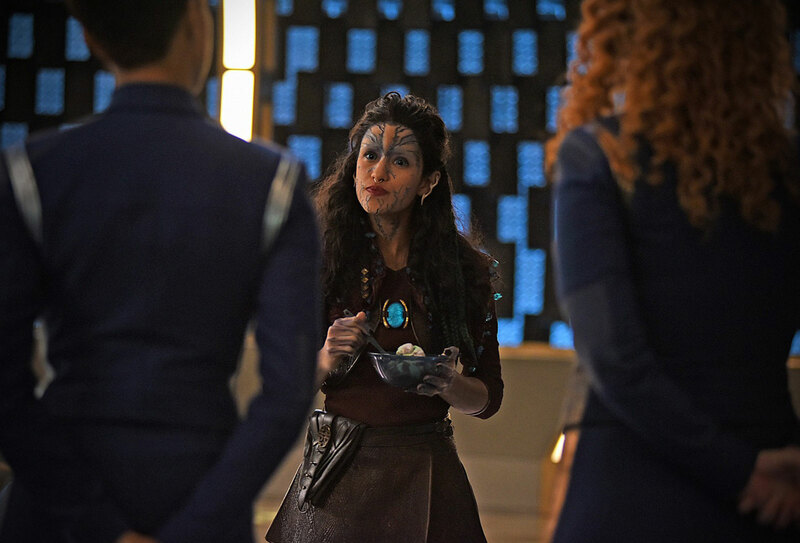 Jinxed Thoughts: Thoughts on Star Trek Discovery S2E13 "Such Sweet Sorrow"
Ok let's hop right to it because this two-parter sets things up very sweetly and I am eager for it to be next Friday already. Last episode ended with Pike announcing that they need to evacuate Discovery and blow it up. Do you think it'll work? Of course not, they immediately discover that the sphere data has merged with the Discovery and is protecting itself, preventing any attempts to blow up the ship either by remote controlled auto destruct or photon torpedoes. They even have them in the games? Something funny happens before then, so silly it made me write half a page of questions in my notebook about something that happens all the time in Star Trek and that I just never have given much thought to before. 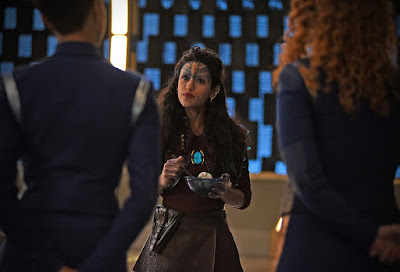 The episode opens with us seeing the crew of Discovery scrambling to evacuate and we hear Michael talking, because apparently she is recording a personal log. What, now? When we're about to evacuate? She literally says "Personal log: we're evacuating the Discovery...". Well clearly you're not? 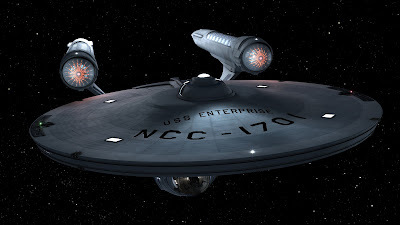 And of course that got me thinking... personal logs has been a main stay of the Star Trek series ever since TOS but I've actually never given them much thought. Clearly their main purpose in the series is to give us viewers a way to hear different characters thoughts. But what is their purpose lore-wise? Is everyone required to keep personal logs, and how does that work then? Do you have to fill something out every day, or just when something out of the ordinary happens? And if you're not required, does it just so happen that everyone is really keen on chronicling their life in the future? And they never seemed very personal but who is supposed to have access to them? Are there rules for what or when you can fill something in? Surely, mid-evacuation in a war might not be the best chosen time. Many questions, but I wasn't finished being confounded there. 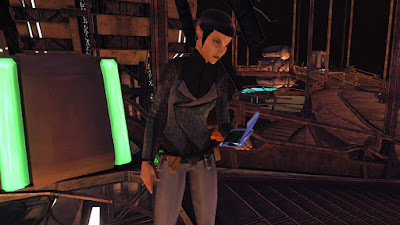 Michael also states in her log, while evacuating, that Control has cut them off from communication with Starfleet and they only have ship-to-ship communication. Since they intend to destroy Discovery, why is Michael even bothering to record something now? Where does the recording go? They are actually getting help from Pike's old ship, the Enterprise. Yes, we are going to get interior shots from the Enterprise. Maybe all the logs get transferred over there, who knows. The Discovery "docks" with the Enterprise by shooting out some sort of corridors that literally unfold in space and hook onto the ship. Seeing it I couldn't really decide if I thought the idea and execution was really cool or really stupid. Unfortunately I was rather leaning towards the latter, but maybe it makes sense that they would have this extremely elaborate evacuation system that exactly fits another ship even though they could just transport over? Hey, why weren't they just transporting? As soon as they get onto the Enterprise though, cue intense fan service. They throw probably about five retro-sound effects from TOS at you within the first ten seconds of Pike and co walking around on the ship. 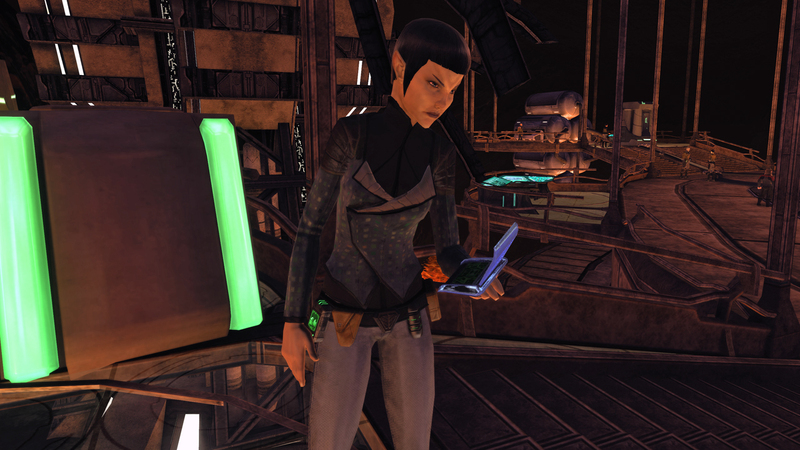 And then they get onto the bridge, which doesn't look exactly like the TOS bridge of course, but it's a very nice modern version of it that I quite liked. We already know that Number One is represented, but I'll be honest and say I haven't paid enough attention to the other crew on Pike's bridge in his TOS pilot episode to know if they are also faithfully represented in this episode. He calls some of them out by name, which makes me think they probably are. At this point we're still at them trying to destroy the Discovery and then realizing they can't. Michael, who touched the time crystal in a quick scene while evacuating, is having some weird parallell time visions on the bridge, where she sees Control-Leland catching up to them and shooting everyone. In her vision, everyone (even Philippa) stands around like geese just waiting to get shot, so I don't know what that was about. In fact I don't understand her time vision at all. When Pike touched the time crystal in the previous episode, he was told that he couldn't avoid that destiny. But now Michael can? And what is her time vision even about? In the episode they make it seem like them shooting torpedoes on the Discovery will lead to Control-Leland murdering them all, but Michael managed to stop them before that happens and then all is well? Yeah I didn't get that part at all. I know time is relative, but still. They also have a big issue with time frames, or sense of time, in this episode. Everything revolves around when Control-Leland will catch up to them. When they are trying to destroy Discovery the time frame is "an hour, maybe less". Then we see them sitting in a meeting room trying to figure out what to do next and you really get the feeling that their "one hour, maybe less" surely must've passed by now. Michael figures out that the time crystal they got in the previous episode is meant to be used to bring the entire Discovery into the future. Fortunately for Michael, her mom talked a lot about what gear is needed to make a time jump in her logs. Convenient. But I guess if you're stuck all alone on a desolate planet in the future you'll end up talking about just about everything in your logs. Again with the logs though, who was she expecting to see them? 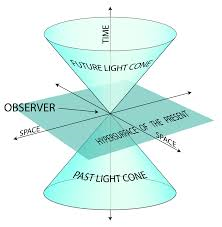 So now they need to make that happen, ergo build a time suit for Michael and charge the time crystal. They also figure out that the signals must come from another time jumper, since Gabrielle (Michael's mom) said she hadn't sent them. They decide that Michael is the other time jumper and because of this whenever they hit a snag another signal should appear to help them. Well, they've hit a snag. They don't know how to charge the time crystal. And lo and behold, a signal appears. This time over the planet Xahea, where a certain Po is queen. If you've seen Tilly's "Star Trek Shorts" episode, you'll know who this person is, as that episode shows Tilly getting to know Po. It's interesting that they're referencing another ST Shorts, one that just like Saru's turns out to be quite important to have seen to get the whole picture. I wonder if the other remaining ST Shorts will be equally important in some future episode? Tilly figures out that the signal is by Xahea because Po has the knowledge and resources to help the charge the time crystal, so they spore jump there. And by the way, since they have the spore drive, why are they afraid of ever getting caught by Control? They could just jump to the furthest reaches of the Delta Quadrant and Control-Leland would take 100 years to catch up to them. At which point they could just jump back and go neener-neener. But I guess they might be concerned about what damage Control might do while they're gone. But at least the Sphere data would be less accessible for Control. She really likes her ice cream. Po comes to their ship and helps them figure out what they need to charge the crystal. While they are all busy building everything they need to make it work, and again with the time frame - they say they have somewhere around an hour and there is just so much happening that you think they can't possibly get all that done within that time. Where was I? Ah yeah, while they're all busy building everything, Stamets and Culber meet and try to... reconcile? Or something. They talk a bit and it basically ends with Culber telling Stamets that he is transferring to the Enterprise. So much for the previous episode giving us a bit of hope that they would get back together again or at least become friends or something. Little of that matters though, because all I could think of was how ill-timed their conversation is. I get that they probably want to get it out of the way before they maybe all die, but right now they're really busy. What is it with people choosing to do the silliest things at the worst time in this episode? Just to make sure everyone is with me at this point - Michael is going to take a time suit and make a worm hole and bring the Discovery through it and end up somewhere in the future, hopefully far away from Control. Philippa thinks Michael is trying to be a martyr, overall she seems to have the same thoughts on Michael as Spock, that Michael has some sort of Jesus-complex and has to try to save everyone all the time. Not that her saying as much to Michael makes her change her mind though. As Michael is about to leave, Tilly tells her that basically the entire main cast of Discovery has decided to come with her to the future. How convenient for the series! Because it would've been dull with just Michael in it. But now we have everyone. Except Pike who returns to Enterprise and Tyler who stays with Section 31 in our regular time. We knew Pike would be removed from the series sooner or later, because he needs to have his accident. To see Tyler go though... I mean I won't miss him, but I didn't expect the writers to remove him considering they've really done everything to keep him in the series so far. The episode ends with the time crystal still charging and Control-Leland catching up to them. Michael shows them an image of all of Control-Leland's ships in a circle around the Discovery and Enterprise and says "we're surrounded". You're in space though dummy, just having ships on a horizontal plane around you doesn't mean you're surrounded. An armada trying to prevent someone from leaving would surely spread out like a ball around a ship, rather than like boats on water. Anyway, the episode ends there and of course it's a major cliffhanger. I'll give them this, I am so curious as to how this season will end now. The possibilities are endless. If they do jump to the future, which future will it be? Will they continue the fan service and show us stuff from TNG, DS9 and VOY as well maybe? That has potential to be really cool, as long as it makes sense for however the story is moving forward.